Wednesday, the House unanimously passed H.R. 6364, the bipartisan Frank Buckles WWI Memorial Act. The bill was introduced by Congressman Ted Poe (R-TX) along with Congressman Emanuel Cleaver (D-MO) and Congresswoman Eleanor Holmes Norton (D-DC). This legislation (1) establishes a commission to commemorate the centennial of World War I; (2) re-designates the Liberty Memorial of Kansas City as the “National World War I Museum and Memorial;” and (3) establishes a new, stand-alone World War I Memorial on the National Mall. The worst casualty of war is not to be forgotten. Wednesday, the House let the world know that we will never forget the heroes of World War I. More soldiers died during World War I than in Korea, Vietnam, both Iraq Wars and Afghanistan combined. It is only fitting that they are honored in our nation’s capitol before the centennial of the Great War. 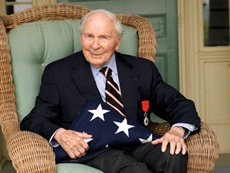 Corporate Frank Buckles was the last living World War I veteran. It was his wish to see a National World War I Memorial in Washington, D.C. We salute Corporal Buckles and the rest of the Doughboys who fought over there. I hope the Senate and the President will do the same.